The entire ground-level of the buildings consists of an open space floor plan of living-, kitchen- and dining-areas. The living space is lowered via two steps which creates an inner topography and interesting perspectives. Large-scale sliding-elements made from glass connect the inner living landscape with the garden. The central staircase sculpture with open fireplace leads to the sleeping area on the upper floor. These private rooms with outlook into the garden seem to float above the common areas. The areas of retreat and privacy on the upper level are versatile and designed for use as bedroom, children’s room, guestroom or even home office. At the same time they are facing the peaceful and quiet garden and offer a view onto the green. Apart from these panoramic rooms another bathroom, a lavatory and dressing room are located on the upper level. The buildings „An der Obstwiese“ possess a basement floor as an additional level, which can be used for multiple purposes. Its main room has a bathroom, which receives light from the garden, and can be used as hobby room, private spa or otherwise. Furthermore, the technical equipment and large storage rooms are located in the basement. Apart from the entrance area with cloakroom and restroom, the ground-level, too, offers a walk-in storage room. This concept allows easy transport of shopping goods directly from the car in to the storage room. Towards the street-side, below the overhang of the upper floor the charging infrastructure for electro-mobility is located in a protected outdoor area whereas a canopied outdoor space towards the garden-side serves as an extension of the living space. The spacious room layout is suitable for family life as much as it is for presentable events of private or professional nature. Particular focus is given to the use of sustainable and healthy materials. Wood, wood-fibre insulation and loam rendering dominate construction and surfaces and stand not only for naturalness and health but also for complete reusability or recyclability, respectively. The fireplace sculpture with staircase between ground-floor and upper level is the warming center of the house and is fully covered in loam rendering which not only provides favorable indoor climate properties but also creates a natural atmosphere. The same applies to all hallways on the upper level. Not only in the use of natural materials and the realization of a regenerative Plus-Energy-House, but also in the tangible room concept lies a philosophy in which the human is part of its experienced environment. The full-height windows on the ground-level create a maximum level of transparency between the inside and the outside. The transition between the inner rooms and the private green space thereby feels blurred – architecture and garden constitute a continuum. There is no strict separation of areas but instead a sensibly arranged series of spaces that are designed specifically with regards to shape, use and form – which can react to each other scenographically. Hereby new contexts and living experiences are generated. As a result, the impression of “living in the green” emerges even from the inside of the protected indoor spaces. This integration of living environment and green outdoor areas allows a varied interplay between building and open space. The garden becomes part of the living room through the unity of spaces of homologous design. 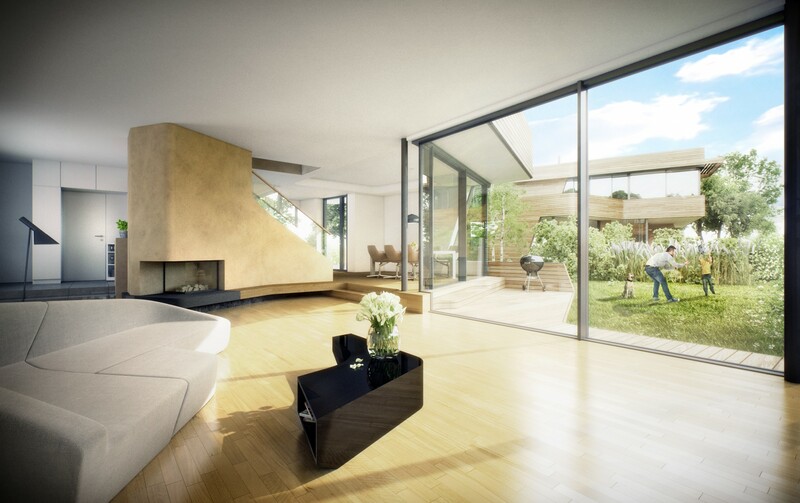 The construction project „Holistic Living“ enables responsible living through intelligent building technology. The Plus-Energy-House can be created thanks to the high density of efficient individual components – this integral energy concept already achieves today our demands of a mobile, healthy and responsible life of the future. There is an energy management System built in to reduce the daily peak loads. Heat pumps, refrigerators, dishwasher, battery-charging-stations of the EVs are to be switched on during the times of day where the consumption of electrical energy is low. Installed household appliances and lighting are energy-efficient. In Addition water-saving mountings are used. 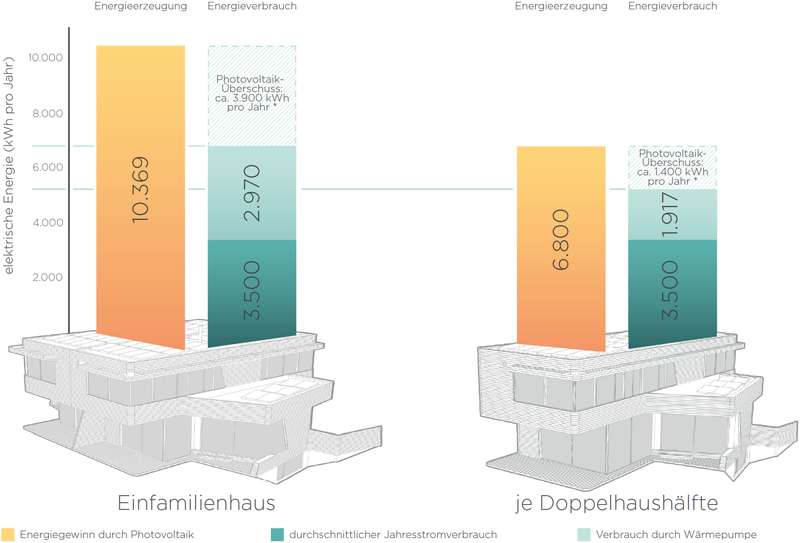 The solar energy of the PV-unit used by the tenants is completely free. Through this approach running costs for heating, hot-water and electricity are reduced. For the supply of water intended for garden a a rainwater cistern has been installed. In order to further reduce water consumption in the house, there is also a gray water recovery unit that is used for toilet flushing. a bus-system allows an increase of energy efficiency through building automation; this is achieved through control of the ventilation, anti-glare shields, heating as well as, during summertime, cooling. Displays in the living areas make it possible to visualize parameters of building automation. This includes information on the room temperature, the output of the photovoltaic system, the charging status of the electric car, the battery charge status, weather data, current energy consumption of the building, lighting settings and anti-burglary and fire protection settings. It is also possible to retrieve this information on your own smartphone.